PPF (Public Provident Fund) is one of the most popular and one of the best debt investment instruments. 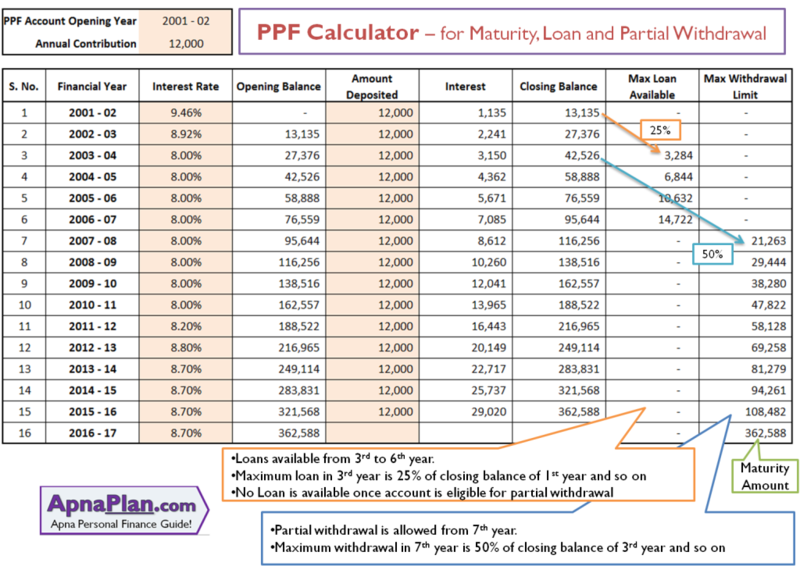 We have Excel based calculator for PPF Withdrawal, Loan and Maturity. This PPF calculator can calculate the maximum loan eligibility, partial withdrawal eligibility and the maturity value at the end of 15 years. It takes the historical interest rates automatically depending on the financial year. The future years where the interest rates have not been declared takes the value of last declared rates. You can download Excel based calculator below. The loan facility is available from third to sixth financial year of opening the account. The maximum loan that can be taken is 25% of the PPF account balance at the end of preceding two financial years. For e.g. for FY 2013-14 you can borrow 25% of the amount present at the end of FY 2011-12. The interest rate on loan would be 2% higher than the prevailing interest offered on PPF (since December 1, 2011). Inactive accounts are not eligible for loan. You can borrow multiple times in the third to sixth financial year, once you fully pay the preceding loan. PPF Form D needs to submitted to apply for loan. Partial withdrawal is available from seventh financial year from the account opening financial year. So if you opened account in FY 2011-12, the earliest you can withdraw is FY 2017-18. The maximum amount you can withdraw every year is 50% of the account balance in the preceding 4 financial years. Only one withdrawal can be made every financial year. PPF Form C needs to submitted to make partial withdrawal. In case the withdrawal is from account opened in the name of minor, a declaration needs to be given by the guardian that the amount would be used for the benefit of the minor. PPF account matures at the end of 15 years from date of account opening. You can request for extension of PPF account for 5 years at a time. This extension is possible for any number of times. This means that you can continue PPF for a long period of time. For extension you need to choose if you want to extend the PPF with contribution or without contribution. In case of extension without contribution the balance in PPF account continues to earn interest and you need not contribute anymore. You can also withdraw entire amount anytime. In case of extension with contribution you can withdraw only 60% of the balance before the start of this 5 year extension period. 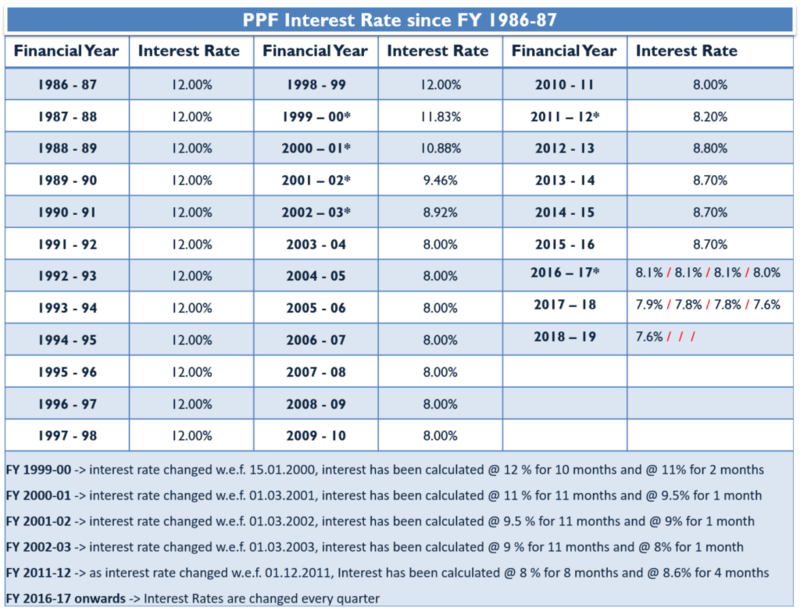 The table below shows the PPF Interest Rates since 1986. Voluntary Provident Fund – A Good Tax Saving Retirement Option! HOW TO WITHDROWAL PPF FOR NEW HOME? You can withdraw PPF depending on the years invested. You can find more details on PPF withdrawal here. Dear Sir, I also 29-03-2016 start to PPF account interest rate 8.7%, but 01-04-2016 PPF interest rate 8.1%. 15 years after which interest belong. Dear Sir, I opened PPF account on 04-04-2016 & the same day i deposited Rs. 500/- Kindly Let me Know that when account will be mature. Dear Amit Ji, The bank has given me one statement copy where it has been mentioned that account maturity Date as 01-04-2032, request you to Kindly explain. You can open PPF account anytime with just Rs 500. Then you can make any amount of deposits anytime you want. So take your call. Anytime is good for PPF account. There is only limit for investment in a financial year and no upper limit on maturity value of PPF. Sorry Niranjan I could not understand the question. But if you are asking the maximum amount you can deposit in PPF – it’s 1.5 Lakhs every financial year and yes you can deposit this entire amount in 1 installment. sir if I invest 100000 in PPF at the end of the year on 31st march and continue in same way till maturity then how much will I get? Assuming interest rate of 8.7% for every year and maturity period of 15 years you would get approximately Rs 30.5 lakhs on maturity on deposit of Rs 1 lakh every year. sir I got 3117275 if invested on 1st april in the beginning of every year and 3217275 if invested at the end of every year on 31st march. Is it correct? Yes you may be right as I had given an back of the envelop approximate figure.The difference in both the figures is because in case of April 1, you are putting your money for 11 months more.